For each rota you create in ChurchSuite, a unique rota email address is also created for that rota. The specific rota email address can be located on the Rota page within your Rotas module. 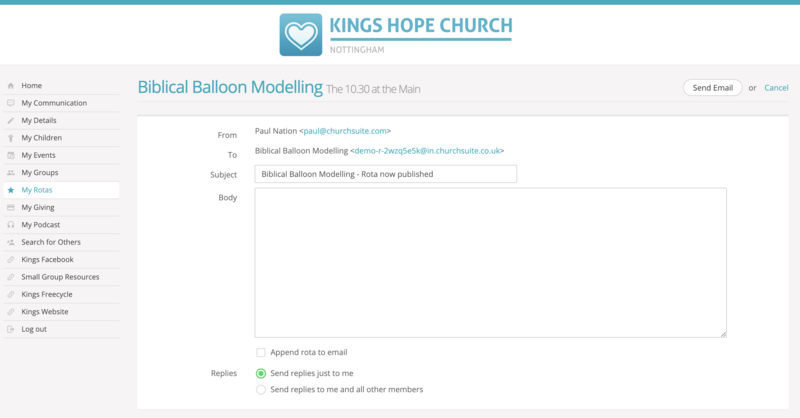 The rota email address is helpful for circulating swap requests, or to circulate prayer requests or special information about a change in ministry processes. any ad hoc people that have been added to the rota with future dates remaining on the rota. Anyone who is not a rota member is unable to use that email address and will receive a bounce-back email notification if they attempt to send an email to the rota group email address. 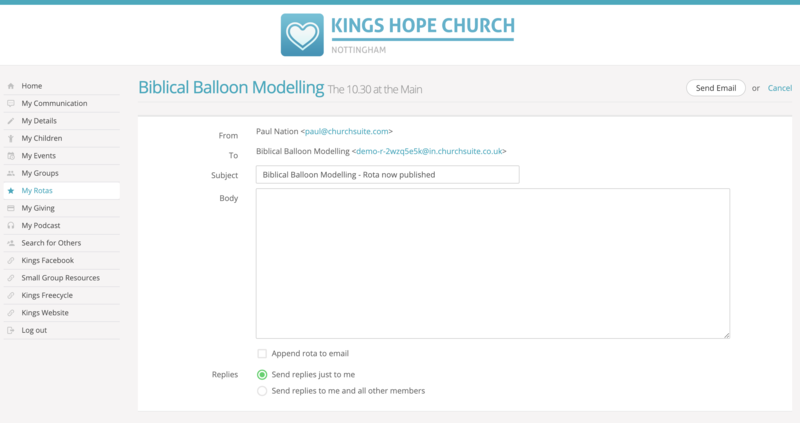 In the Rotas module option in ChurchSuite, you can designate how rota group emails should function. 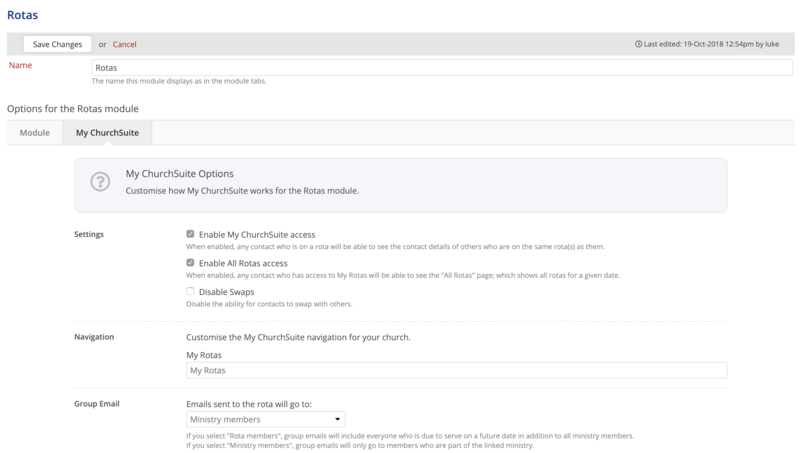 Click through to the My ChurchSuite Options for the Rotas module and locate the Group Email option at the end of the page. Here you can specify who rota group emails will go to - either to Ministry members or Rota members. Ministry members is more restrictive since messages will only go to those rota members who are in the associated ministry. Since rotas often contain ad hoc people who may have been added to a rota to serve one-off dates, but who are not in to the rota's underlying ministry, you may prefer to choose the Rota members option. So while all rota members can send group emails, this module option determines who receives the group emails - the ministry members or all rota members. Save any module settings you change before leaving the page. A further consideration is that since a rota will likely cover a wide range of dates, rota group emails will be sent to all rota or ministry members contained in that rota with future serving dates remaining. Therefore if you've constructed highly elaborate ministry and role structures, perhaps in an attempt to combine several separate ministries into one rota, the email distribution list could become quite sizeable, resulting in people possibly receiving a considerable number of emails unnecessarily. We therefore recommend, where possible, creating separate ministries and rotas, and only run each rota for an appropriate length of time; perhaps a term or a quarter or maybe a year. This will ensure rota communications are directed only at those who need to know and in a timely manner. Within the My Rotas section of My ChurchSuite, there's a [rota] Email button located at the top right of the rota page. Being a group email, messages are distributed to the group i.e. everyone who is a rota member as defined above. Clicking the [rota] Email opens the email editor. Note that at this time email attachments are not possible (feature coming soon!). The email author can provide an email Subject and compose the Body of their email. Before the group email is sent, the author must specify how Replies are to be handled within the group - choosing either to Send replies to just me (the author only) - ideal where you just want to solicit a response or feedback - or to Send replies to me and all other [group] members - ideal for discussions. Once this option has been set, all subsequent email threads related to the first message will follow this protocol. Group emails are "closed-group" messages that are private to the group's members only, and as such are not logged or recorded in ChurchSuite's communication logs in the Address Book. They are however visible to the rota group's members in their My Communications section in My ChurchSuite, including the author. Rota members will cease to receive rota group emails when they are removed from the rota's underlying ministry, or when ad hoc rota members have served their final date on a rota. A rota group email sent with Send replies just to me will always disclose the sender's email address in the reply-to email address field of the email, necessary so that any replies are correctly routed back to just the sender rather than to the group's email address. This happens even if the sender has their email address set to not be visible to other in My ChurchSuite. It is not possible to send an email requesting replies to just one's own email address and not have that email address disclosed. A rota group email sent with Send replies to me and all other [rota group] members will disclose the rota's private group email address in the reply-to email address field, ensuring that replies are routed back to the group email address and therefore to all the rota group members. This is done without disclosing all the rota group member email addresses. Ministry overseers have an additional rota group email option, shown below - the Append rota to email option will append the rota and rota member list to the body of the email before sending - just like overseers can do when they first publish a draft rota. This feature may be helpful when there has been a significant update to a rota that an overseer want to ensure is in people's inboxes to alert them to the changes.